Play only as your first click and only if the Corp scored no agendas during his or her last turn. Gain 10credit. The Corp gains 5credit. You cannot initiate any runs this turn. Can the Runner play Peace in Our Time if they’ve already made any runs before spending any clicks, such as with Out of the Ashes or Jak Sinclair? On one hand, it has a lot of similarities to Medical Research Fundraiser, and that card isn't played much at all. And this one even costs an influence to put in your deck! On the other hand, it costs 1 to play, and gives you a net return of 9, without even requiring the extra clicks present on things like Day Job or Lucky Find. 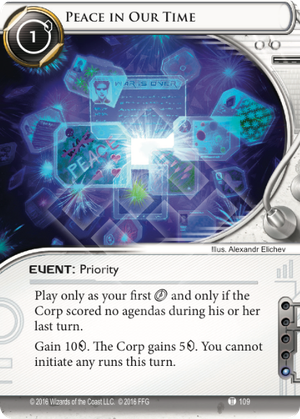 The downside is still going to be a dealbreaker for a lot of decks - giving the corp a boost of 5 is generally not a good idea. (Even if it does activate Beth Kilrain-Chang!) But for decks that aim to deny the corp chances to spend money, (Valencia Estevez: The Angel of Cayambe, Noise: Hacker Extraordinaire, etc) I think this could be a really good card. Probably a niche card, but I expect it will still probably see some play. 9 for one click is probably too powerful an effect to pass up, for any deck that can afford to ignore the downside. And such decks definitely exist. In Tapwrm's case, it's even more restrictive -- you can only play it after a successful run, so it needs to be played before Peace. The pressure gains from Beth, I think, aren't worth it. In most instances, you'd rather have a poor corp in the first place, and Beth herself is mitigation to an inherently disadvantageous status quo. Hernando too -- a +1-3 cost to their ice is largely countered by the resources you just handed them, and that's assuming they can't pare down their resources in other ways to mitigate. That leaves Peace as a Tapwrm followup. And to justify it, you're saying you're running a deck that goes through a LOT of cash constantly, or can turn the burst of liquidity into an immediate win. Or, basically, you're playing Dyper.